Have you seen The World's End? How about Spaced or Shaun of the Dead? First, there were geeks. Then came the zombies. Then, a secret society. And this time? Well, that’s a surprise. In 1999, the comedy team of writer/director Edgar Wright and actors Simon Pegg and Nick Frost burst onto British television’s Channel 4 with a seven-episode series called Spaced. In it, lonely singles went looking for love, for rent money, for friends, and for reasons to live. Did they find these things? Usually, no. Instead they ended up talking about Star Wars, video games, pints at the pub, paintball, or other pop-culture phenomena. (It’s on Netflix now. Check it out.) In 2001, seven more episodes brought their story to a close, but the series’ rise to cult status was only just beginning. Three years later, they were back with Hot Fuzz — a send-up of American buddy-cop action movies. This time, Pegg was Nicholas Angel, a veteran city cop who gets reassigned to a quaint, “crime-free” village in rural Gloucestershire, with a simple-minded partner named Danny Butterman (Frost). There, they work hard to catch runaway geese, lecture adolescents about vandalism and drinking, and overcome boredom. Little do they know that their smiling neighbors are harboring criminal secrets that will redefine your perception of the Neighborhood Watch program. Now we’ve come to The World’s End. Wright, Pegg, and Frost are almost 15 years older than when they started, and the movie proves that they’ve maintained their creativity, their humor, and their enthusiasm. 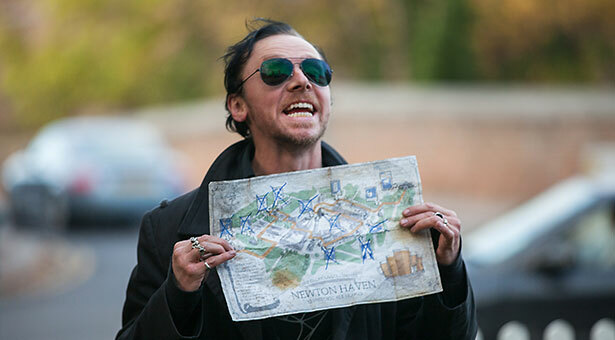 The World’s End fits right into the series, even as it turns some things upside down. In this film, Pegg isn’t playing a failure or a tough-talking lawman. This time, he’s a mess. He’s Gary King — an alcoholic, a liar, a leech, and a party animal. He’s 40-something going on 18, desperately trying to rekindle the chemistry with a band of friends from his youth. Once upon a time, they attempted a one-night pub crawl of 12 pubs in the town of New Haven … and failed. Gary is determined to round up the old gang — including Andrew (Frost) and three others played by The Hobbit’s Martin Freeman, In America’s Paddy Considine, and Sherlock Holmes’ Eddie Marsan — and to succeed in gulping down all 12 New Haven pints. But things have changed in New Haven. Forces of conformity controlled by something called “The Network” are taking over the town. But the nature of this evil is both bizarre and mysterious. Will these guys give up their freedom in order to experience a factory-made brand of happiness? Or will they fight for their flawed and fractured humanity? To say more about the plot would be to ruin the surprises. Suffice it to say that Wright and Company are once again telling wild, Twilight-Zone tales as a way of celebrating friendship. Pegg and Frost turn in the most impressive performances of their careers. And the result is the series’ most hilariously over-the-top story. (I doubt that moviegoers have ever heard an inspirational speech as unsettling as the one delivered in this film’s climax.) What is more, it’s the wisest and — dare I say it? — the most grown-up film of the bunch. Is it crass? Well, yes — that tends to come with this British comedy territory. Is it violent? Yes — but only in the comical, B-movie kind of way. Have you ever seen a fight scene in which the heroes’ primary goal is to avoid spilling their drinks? Is it meaningful? In a funny way, yes. This time, they’re arguing with many Hollywood movies about “man-child” immaturity. Instead of giving us characters who find happiness by rediscovering their youth, they show us the folly of resisting adulthood. In this film, the “kid at heart” isn’t the solution to the problem — he is the problem. They affirm the importance of growing up, fulfilling commitments, breaking addictions, and fighting to save each other from despair. Wright, Pegg, and Frost are busy, talented guys. Pegg and Frost are both married with children. Wright directed Scott Pilgrim vs. the World, co-wrote The Adventures of Tintin with Steven Spielberg, and is working on a movie about the comic book hero Ant-Man. Pegg plays Mr. Scott in the new J. J. Abrams reboot of the Star Trek series. And Frost stars in an upcoming television series called Mr. Sloane. And yet, they somehow find the time to go on being brilliant — and to stop in Seattle to talk about The World’s End. Response: Spaced was such an imaginative, hilarious series, I’m glad to see it’s finally available on Netflix. Have you been hearing from new fans? Pegg: Yes! Every day on Twitter somebody says, “I’ve just discovered Spaced.” It’s so weird. It must be great to finally have an way to share it with people so easily. Pegg: Yeah … 15 years after the event! The movies you’ve made since then have played out like a Spaced cast reunion parties … with supporting actors like Julia Deakin and Michael Smiley returning. And Mark Heap [who played Brian the tormented painter] shows up in The World’s End! Wright: Mike Smiley’s been in all three of the movies. Mark Heap hasn’t been in any of the movies [until The World’s End], and I think people assumed we’d fallen out with him. But actually, we’ve just been trying to find him. Pegg: Mark Heap [threw] his back out just before we started shooting Hot Fuzz, so he couldn’t be in it. We were absolutely determined to have him in The World’s End. Wright: Over the three movies, we’re gotten most of our Spaced regulars in their somewhere. Julia Deakin’s in all three movies. So many of the most successful pop-culture imaginations quickly devolve into repeating themselves or offering more tepid versions of the creativity that made them famous in the first place. Even Pixar has been criticized lately for lacking that spark of inspiration that we saw in the Toy Story movies and their early work. But as a team, you three seem to be drawing from the very same well of creativity and crazy ideas that made people love your work in the first place. How do you keep in touch with that original enthusiasm that you had when you made Spaced? Pegg: With Pixar, I don’t think it’s about a lack of enthusiasm. I think it’s about commercial pressure for them to make sequels. It used to be that they would never base anything on what had come before — it was all original ideas. They’ve just been encouraged by other forces to trade on their amazing back catalog and make some sequels. I think because we’re making films which are more mid-level in terms of the budget, we get a little more opportunity to do exactly what we want to do. We haven’t become jaded and we haven’t lost interest in our work. We still love it as much as we ever did. We’re as impassioned as we were when we made Shaun of the Dead and Spaced. I hope we never change that, really. God help us if we ever start just churning it out, thinking that people will dig it just because it’s us. Frost: I think that even though we have a great deal of respect for the people who like our stuff, we’ve never pandered to what we think they would want. If you do that, you dilute the thing that people loved you for in the first place. We only ever made the films that we wanted to make. Wright: I think people may imagine that the films are more similar than they are. But there’s a big change between Sean [of Shaun of the Dead] and Nicholas Angel [of Hot Fuzz], and another huge change between Nicholas Angel and Gary King [of The World’s End]. You don’t want the same thing three times. Pegg: The dynamic between Sean and his friend Ed is wildly different than the dynamic between Angel and Danny Butterman. Ed couldn’t care less, but Danny is absolutely in love with Angel. But still, there’s always a friendship between the characters. The idea of friendship is what binds all three films together — you’ll find that in their DNA. So how do you avoid repeating yourselves? Even the great rock bands have to work hard to keep their sound fresh. Do you spend a lot of time brainstorming together? Wright: Time apart makes the excitement to work together stronger. I think that when we’ve gone off to do separate projects, when we’ve reunited we’ve wanted it to be really special. We’re not reuniting because we think we ought to — it’s because we want to. That’s what fuels the ideas. In a way, The World’s End is about that … it’s about getting older, and reuniting with friends. I think that helped the screenplay. I don’t think we could have written this screenplay six years ago. Pegg: Also, we have a relationship that’s kind of familiar. I think of these guys and our producers as a sort of family. I’ll go off and do other things, but I’ll always come back … because that’s where I live. It’s exciting when we all get back together with a chance to do our thing, and we relish that opportunity. Frost: We’re not 40-something men trying to make comedy for 21 year-olds. We’re making stuff that people our age would want to watch, and it just happens that 21-year-olds like it. We’re not trying to be younger than we are. The characters have grown up as we’ve grown up. Pegg: Yeah, we’re trying to be truthful so that it’s truthful to anyone. If you try and make a film for 21-year-olds by guessing what they like, it won’t ring true. But if you make a film about being 40, 21-year-olds will like it because they’ll see the truth in it. Wright: One of the things we’re doing with this film is approaching the “man-child” genre in a way that’s much more honest. A lot of those other movies are false because a lot of the actors are pretending to be 26, pretending to be slackers forever, when in reality they’re married and have kids. We wanted to do something about a character that desperately wants to be 18 again and who’s going to drag his adult friends back into the past. While all three movies are very different from each other, your characters have always had to confront these forces of conformity. Normally in a movie like that, the heroes are fighting against the Network for independence and individuality. But this time it’s more complicated. There’s a moment where it’s very clear that the most important thing to Nick’s character — Andy Knightley — is his marriage. That’s a grownup’s value, not an adolescent’s. And you don’t see that very often at the movies. Frost: No, you don’t often see someone committed to their marriage. So many times in these “man-child” films, it’s about getting younger [women]. Andy has that chance, but he doesn’t take it. He likes being married, and it means a lot to him. He’s fighting to make it right. Pegg: You could argue that marriage is a kind of conformity, but what is truly important in this film is happiness and success. Gary King isn’t happy because his heart’s in the past. These guys, even though they’ve grown up, and they might be doing the things they wanted to do, they’re not really happy either. Andy wanted to be in family law, and he’s in corporate law. What matters is that personal happiness. And that’s the true holy grail of life — finding happiness. That’s the whole thing with the Network — what they’re offering is a kind of happiness, but it’s a happiness at the expense of choice. We don’t really offer any answers. Pegg: “Starbucking” became a verb in the film. It was about standardizing individuality. The idea of the death of the old coffee shop on the corner — everybody’s lamenting because it’s been taken over by Starbucks, and yet … in actual fact, it’s probably better in every way! Because Starbucks is in charge of the coffee and it isn’t run by Ma and Pa anymore! So many people at your level of busyness and success seem so burned out. As busy as you are, how do you stay focused? Do you have disciplines that keep you grounded? Wright: We had to make time. With Hot Fuzz, the writing was much more fractured because there were other movies going on, so it was much more broken up. For The World’s End, we set aside time because we wanted to make it. It became urgent in our minds. People ask how we write, and it’s sort of like an office. Simon’s a new dad, and so … we write from 9 to 6. That’s our writing day. We sit opposite each other and we write until it’s done. Pegg: We wrote at Working Title [British film studio offices] in L.A. while I was shooting Star Trek Into Darkness. Obviously, that film has a huge cast, and I wasn’t required to be there every day. So, every day that I wasn’t required, Edgar and I would work from 9 to 5 on the script. It was a juggling act between “saving the universe” and writing the film. Does family life help your work, or make it harder? Frost: It’s hard. Because we’re doing [the movie] for six weeks! Wright: [Laughing.] Every time you don’t see Nick’s back in the film, he has a papoose on. Frost: [Laughing.] A Baby Bjorn! I have to remember that it’s because of my child that I’m doing this. There’s a lot of people who don’t give a --- about their families. But if it means I’ll have to be homesick for six weeks, I’d rather be homesick than not get a chance to do this [movie]. Pegg: What was interesting was that on The World’s End, between the five guys [in the cast] we had eleven children. We are so … not those characters. Of all the actresses you could have cast, I was so delighted that you chose Rosamund Pike. I first noticed her in Joe Wright’s Pride and Prejudice. She’s fantastic. What led you to pick her? 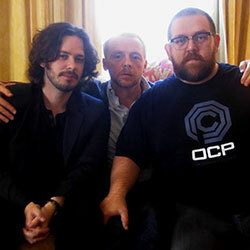 Pegg: [Pointing to Edgar Wright.] A huge crush! Wright: [Laughing.] I had a huge crush on her. She’d been in a couple of Working Title films. The film that really made me notice Rosamund Pike was An Education. She’s always great. She’s got real comedy chops. When we did the first read-through of the script and we invited Rosamund along and she was great. We didn’t think of anyone else. It seems like every week, there’s a new movie about the apocalypse opening. Yours has a very different take on “the world’s end.” Why do you it’s such a popular subject? Is that here to stay, or will we arrive at a sort of apocalypse fatigue? Wright: I think it’s time for a movie where skyscrapers take their revenge. Pegg: I think that it’s on the culture’s subconscious mind. There was that whole 2012, December 21st, end-of-the-world thing. It’s just been percolating in people’s minds, in the culture’s collective consciousness. There are certain things that come out in cinema — you can always trace what’s going on in society through any cross-section of cinematic output, because it generally reflects what we’re thinking about. It just so happens that the end of the world has been on people’s mind since the turning of the millennium, and since and that whole “December 21, 2012” thing. But the thing is, we called our film The World’s End because it’s named after a pub. The only reason we went through with the end of the world was because we didn’t want to welch on the name of the pub. But it was all just because of the name of the pub. Wright: I don’t want to be too much of a downer, but I think we’re seeing a lot of these movies because of a pessimism about our future as a planet that I don’t think used to exist when I was growing up. Star Trek is an anomaly because it’s based on ’60s ideals. But when the space race died, a certain amount of exploratory fiction about “Let’s get out there and find new worlds” was kind of gone. People have realized that even if we send a drone to Mars, we’re never going to get to another planet where we can live. It’s a shame, because even the wonder of Close Encounters of the Third Kind — that idea there might be benevolent life in outer space — is now 40 years old. Frost: I think Dennis Quaid had it right. We need to look into InnerSpace. OK, before we go, will you do me a favor? [Getting out the camera.] Can the three of you fit on that couch? Wright: [Laughing.] Wait, I’m not exactly sure: Is that a photography question, or is that the last question of the interview? Have you seen The World’s End? Spaced? How about Shaun of the Dead or Hot Fuzz? Tell us here, and read what others have to say on this moderated bulletin board. Posted Friday, August 23, 2013, at 5:11 p.m. I was first exposed to Wright, Pegg, and Frost through Shaun of the Dead, which, though I’m not a zombie movie fan, I thought was brilliant. Went to see Hot Fuzz in the theater and thought it was brilliant. Since then I stumbled across Spaced and have watched it several times. Just got back from seeing The World’s End tonight. There’s something endearing about the quirky, flawed, yet hilarious characters these three have created.